Amid Myanmar’s transition towards democracy, a dangerous Buddhist nationalist movement is on the rise, and women are playing a key role. Taung Paw Camp in Rakhine State, in 2012. Credit: FCO/Flickr. (CC BY-ND 2.0). 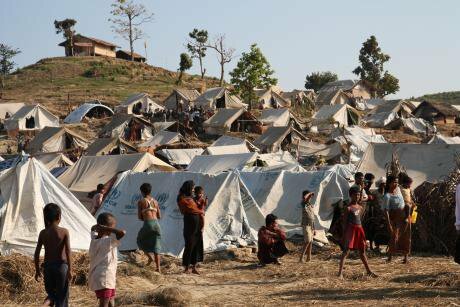 Some rights reserved.In the hastily-built displacement camps of Rakhine state, in the western part of Myanmar, where some 129,000 mostly Muslim Rohingya people have been interned since 2012, there’s very little to look forward to. With no freedom to work outside the camps, the survival of this long-persecuted minority hinges on international aid deliveries and special permits to leave which are granted only for medical emergencies. In August 2017, the latest outbreak of violence returned to the fore long-standing anti-Muslim sentiments amongst the region’s ethnic Rakhine (primarily Buddhist) communities. Some of these communities went as far as blocking vital assistance from reaching the camps and, perhaps surprisingly, women were often seen taking a lead in efforts and protests aimed preventing life-saving aid. "I’ve worked in many complicated places around the world, but I had never experienced this." Rakhine is the most visible and stark example of such extremism in action, but Myanmar (also known as Burma) is home to a growing ethno-nationalist movement that has gained widespread grassroots support. At the heart of the ideology is the idea that Burmese Buddhism needs to be “protected”; extreme notions of ethnic purism and xenophobia; and violence-justifying concepts of “self-defence” against external and internal “threats” posed by Muslim populations, and by the Rohingya in particular. Along with Sri Lanka, Myanmar is considered by many to be Asia’s last bastion of Buddhism. Rakhine State, which borders Bangladesh, is viewed by members of the country’s Buddhist population as the “Western Gate” through which Islam will spread unless action is taken to stop it. This is despite the fact that barely 5% of Myanmar's 54 million population is Muslim. Buddhist nationalists are capitalising on often repeated claims that the Muslim Rohingya are “illegal immigrants.” They use religious and racial rhetoric to present their arguments. Some have made chilling claims that the Rohingya are reincarnated from insects and snakes, echoing the language of genocide heard in other parts of the world. Myanmar’s one million Rohingya have been systematically marginalised for decades, culminating in military “clearance operations” that began in August 2017, which killed an estimated 10,000 people, and brutally expelled more than 655,000. While the UN denounced these actions as ethnic cleansing, a highly influential Buddhist religious leader in Myanmar referred to an ancient religious passage to claim that the killing of non-Buddhists can be justified “during warfare” on the grounds that they are not complete humans. Central to the Buddhist nationalist movement is MaBaTha (the Association for the Protection of Race and Religion), a decentralised organisation of religious and lay persons. Officially established in 2013, MaBaTha’s approach seems to be strategically multidimensional. On the other hand, the group carries out respectable community-based activities that win support even from people who oppose its hate speech. Under the MaBaTha banner, for example, monasteries champion the promotion of “Buddhist values,” provide assistance to the poor, and raise funds to assist communities affected by natural disasters. For underprivileged youth, monastic schooling, often offered by MaBaTha-friendly monasteries, is the only chance they have to access education. Buddhist Sunday schools (Dhamma schools), are run across the country with the support of female activists from the group, who often work as teachers. 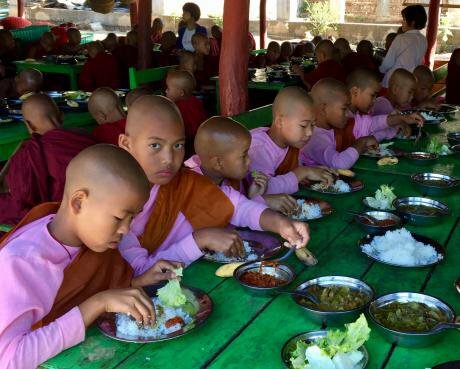 Buddhist pupils have lunch in a monastic school's canteen in Shan State, Myanmar. Credit: Macarena Aguilar.While numbers are hard to pin down, Melyn McKay, an anthropologist studying women’s involvement in Buddhist nationalism, told us that in Yangon (the country’s commercial capital and largest city) alone there are an estimated 20,000 to 80,000 MaBaTha members. She also said that formal membership of MaBaTha by women is large and growing. In only the central Mandalay area up to 3,000 women have formally become MaBaTha members. But such figures may not include “many who participate in marches and such activities,” without formal membership. The roles that women play within MaBaTha vary. Some contribute to administrative duties – managing donations, communications, or keeping historical records. 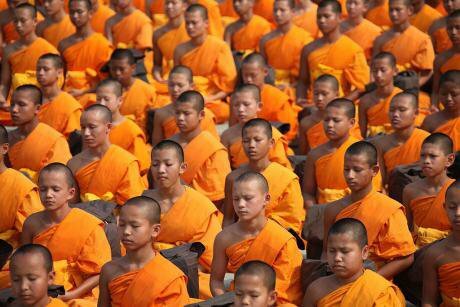 Others teach in Dhamma schools, give talks in their communities on the importance of protecting Buddhist teachings and values, or apply their trade skills. Those with legal training, for instance, may give pro bono support to cases identified by MaBaTha. In a society where women are often marginalised at home and in powerful institutions, including religious institutions, MaBaTha provides opportunities they don’t always find elsewhere, McKay explains. Not only does MaBaTha allow women to study under some of the most respected monks in the country, the leadership also “supported an organisation of nuns pressing for the right to take the higher level exams so they could prove their knowledge of the Dhamma and improve their standing,” she said. Women’s involvement in the movement also goes beyond the religious realm. Their political participation allowed and encouraged by MaBaTha provides “a powerful platform… to elevate the concerns of women and bring visibility to the struggles they face in daily life,” McKay said. According to an International Crisis Group (ICG) report, many women members of MaBaTha specifically reference feminism as a reason for joining the group. The report describes community-level outreach, including efforts to “inform rural Buddhist women about their marriage rights and rights to practise their Buddhist faith,” as well as efforts to support women in abusive work or family situations. Novices meditating. Credit: Honey Kochphon Onshawee/Wikimedia Commons. (CC0 1.0). Public Domain.In 2015, Buddhist nationalists celebrated the government’s passage of a legal package known as the “Race and Religion Laws” which implicitly target Muslim women, regulating, for example, the number of children they can have and their ability to marry. These laws also place restrictions on Buddhist women wishing to marry non-Buddhist men, and force non-Buddhist men to convert to Buddhism before marrying Buddhist women. International commentators, and various women’s groups inside Myanmar, denounced the laws as discriminatory to women and non-Buddhists. However, many Buddhist women welcomed them and female MaBaTha members organised signature-gathering campaigns to support the laws. McKay says that many Buddhist women were particularly supportive of a provision banning polygamy. While this ban garnered attention from the international community, and human rights organisations in the country, for targeting Muslim communities, women supporters presented it as a straightforward women’s rights issue. Nationalist women are now on stand-by to oppose a law aimed to curb widespread violence against women. The draft Violence Against Women and Girls Bill has not yet been publicly released or scheduled for debate, but nationalists plan to protest it on the basis that it may weaken parts of the Race and Religion laws if it does not explicitly prohibit polygamy and forced religious conversions. “Nationalists will take this as a signal that the NLD [National League for Democracy, Myanmar’s governing party] is willing to sacrifice moral and religious imperatives in order to appear tolerant and appease Muslims at the expense of the majority – and Buddhist women, in particular,” said ICG. Women involved in the nationalist movement seem to feel little dissonance between their sense of fighting for women’s equality and their involvement in a hugely discriminatory movement. “They see their work to promote women’s interests and to protect the religion as complementary,” McKay explains. 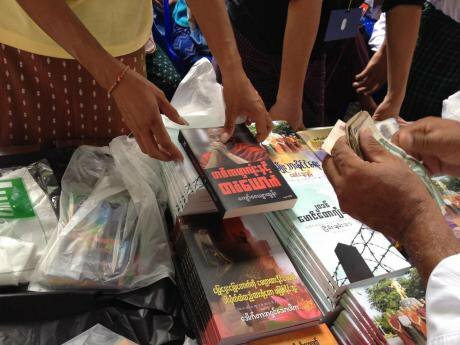 A woman sells books promoting MaBaTha, at the movement's 2017 annual conference in Yangon. Credit: Melyn Mckay.The use of women’s issues to garner support could well be a deliberate strategy of the Buddhist nationalist movement. This is not unique to Myanmar; recent research conducted by women’s rights groups shows a global trend towards the co-opting of progressive language of rights and justice, including women’s rights, by fundamentalist and anti-rights agendas. “Fundamentalist and fascist movements often operate in this seemingly paradoxical way,” says Shareen Gokal of the Association for Women’s Rights in Development (AWID), who has led work on women’s rights and fundamentalisms for more than a decade. “They are patriarchal, espouse oppressive gender norms and perpetuate discrimination and violence. But at the same time they offer women involved opportunities to experience some form of empowerment through political action, participation and even leadership – although the limits may vary – so long as their involvement serves the movement and ideology,” Gokal told us. When it comes to ideologies where anti-Muslim sentiment is central, as in Myanmar, women’s rights arguments take on another layer of significance, she added. "You find those who have had no interest in gender equality suddenly speaking the language of women’s rights to justify their hate-filled ideologies." Behind the individual motivations of women MaBaTha members sits a complex political backdrop. Buddhist nationalist ideas are by no means new, but things have gone up a gear in recent years as the country transitions towards democracy after decades of military rule. In opening its borders to foreign trade, the neoliberalisation of Myanmar’s economy has exacerbated poverty and inequality, which have fuelled the scapegoating of non-Buddhists, and in particular Muslims and the Rohingya. State control of media has also skewed the nation’s perceptions of ethnic minorities, and sustained anti-Muslim sentiment. Some analysts have suggested that economic interests are fuelling recent, extreme violence in Rakhine, and that a new multibillion-dollar China-Burma oil and gas pipeline may be connected to the state’s expulsion of the Rohingya and subsequent land seizures. The Buddhist nationalist movement shows no signs of slowing down soon. At present, it seems that hostility towards the Rohingya population is one of few things binding together Aung San Suu Kyi’s NDL party, the army that once opposed her, and the majority of people in Myanmar. Whichever direction the movement takes next, it seems likely that women will remain at its forefront.